This question can be usered by the visualisation service Mapnificent, which was developed by the German student Stefan Wehrmeyer. The websites shows the area within the city, which can be reached from a given location within a spezified period of time. Mapnificent also provides an API where this data can be used for own custom applications. Wehrmeyer started his service for Berlin and London. Now Mapnificent supports numerous cities in Europe, Austrialia, New Zealand and the US. The calculation of travel time are collected based on the GTFS Data Exchange. The GTFS data include information about all possible routes and stops, including travel times between these stops. With this information the service can calculate distances how far you can travel from a given point and aggregates this information to a service polygon. The result is delivered to the Browser as JSON and interprated on the map. The parameter are the start location and maximal travel time. This parameters are set on a map and via a slider. With the implemenation of an HTML 5 web worker Magnificent calculates all stops which are reachable within the limitations and illuminates the region on the map. 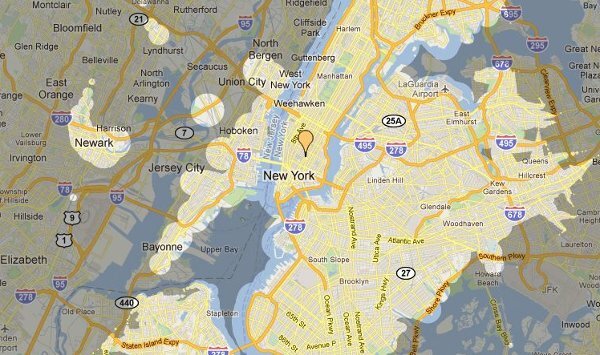 This technique can be done via a HTML 5 Canvas Element, which is overlayed over the Google Map. Explicit departure times are not taken into account, this information is estimated. The algorithm uses stops in a way that wating time is minimzied. That's not always correct but reates good results. Transfers are calculated as one third of the clock cycle. Wehrmeyer has tested his system in Berlin: 53 percent of the test drives produces a deviation of less then 5 minutes. and 96 percent of all drives the error is less then 20 minutes. Data from Berlin do not source in public institutions. For this reason Wehrmeyer, who has developed this project as student of the Potsdamer Hasso-Plattner-Institut, make demands on improved Open Data. The posibilities for solutions for cities and communities who provide Open Data are proven with the Mapnificant project. Stefan Wehrmeyer provides his calculated data via an Open API for further use. Congratulations!